Havards Blackmoor Blog: Mystara, The Known World, The Continent or the D&D Game World? Mystara, The Known World, The Continent or the D&D Game World? Mystara is one of the most underrated of the D&D Game Worlds. The sheer number of game material produced for this setting might surprise people. During the TSR era, it was one of the best supported settings. Unfortunately, this is not something most people are aware of today. One of the reasons for this is that the vast majority of the Mystara products did not carry a Mystara logo. Another dicussion that often comes up that I wanted to look at here is the origins of the name Mystara and the other names used over the years to describe this setting. Some fans of the setting don't like the name Mystara. This is perhaps understandable since it was a name that was added late during the publication era of the setting. Mystara started out as a home campaign in Akron, Ohio. But in published form it first saw the light of day in 1981 in the module X1 The Isle of Dread. This means Mystara was TSR's third oldest setting, predated only by Blackmoor and Greyhawk. I wrote in more detail on the origins of this setting here. When it first appeared in X1, this world was simply referred to as The Continent. Later the names The Known World and the D&D Game World were used for the most part of the settings history. The name The Known World gradually became associated with a single part of the setting; the region featured on the map from X1 where it had first appeared. For most of the settings history it didn't really need a name. 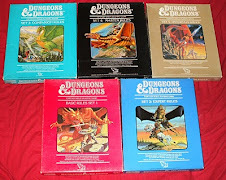 The D&D Game World was sufficient because unlike AD&D, every book published for D&D was assumed to take place in this world. However, as the game world expanded a need for a name appeared. 1) The BECMI D&D Setting had grown beyond the Known World/X1 area long before the Mystara name was used in print. 2) The name Mystara appeared in print in several BECMI products before the AD&D Mystara line was launched, most notably in the Champions of Mystara Boxed set. "....there was no way to equate the Known World with Blackmoor, the Hollow World, and the Voyage of the Princess Ark, which all concerned areas outside the Known World." Over the years the world presented in X1 had grown. Blackmoor had been incorporated into the world's past with the DA modules. The Hollow World and the Voyage of the Princess Ark were massive expansions to the setting. The name Mystara first appeared in print in 1991 with Dragon #172. AD&D Mystara did not appear untill 1994 so it seems unlikely that this was simply a name invented to prepare for taking the line into AD&D, even if Bruce Heard or others at TSR may have considered that as an option early on. Love it or hate it, the name Mystara stuck. It is also a name that has been adapted by the Mystara fan community and having a common name for the setting we all are fans of is important in preserving that identiy. I forgot to mention the name Urt which is given in the Immortal Set (Gold Box) which states that the planet is a Megalith (although a unique one). Some believe that the Hollow World somehow negated this concept, but I don't believe that to be the case. In fact WotI also has a reference to the possibility of the planet being alive in the description of Terra.